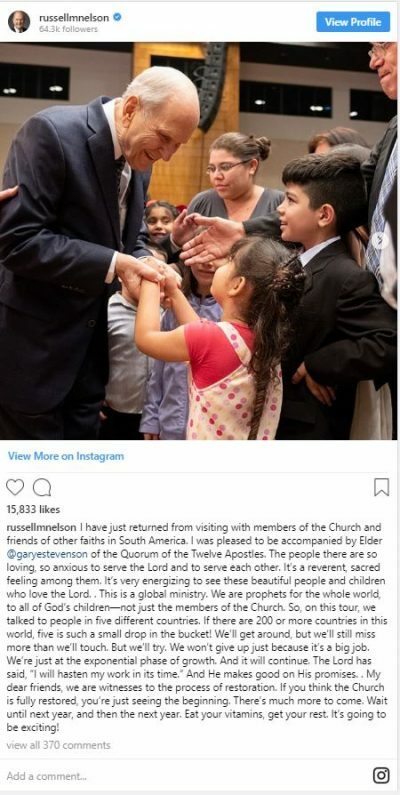 President Russell M. Nelson, along with his counselors in the First Presidency and members of the Quorum of the Twelve Apostles, can use Instagram to share the light of Jesus Christ and personal experiences that have taught them about the principles of the gospel. 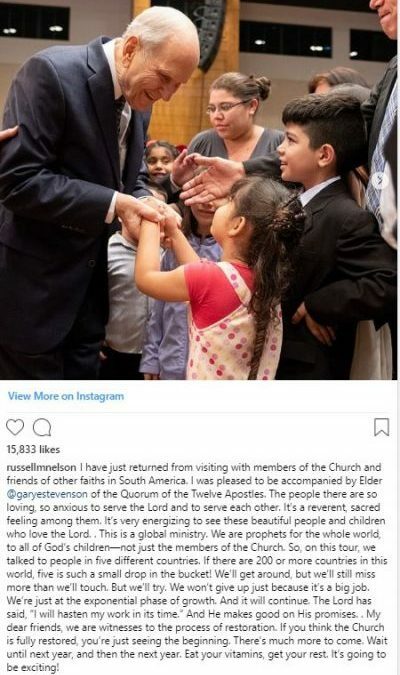 Leaders of The Church of Jesus Christ of Latter-day Saints use Instagram and other social media channels to reach people all over the world. 80% of Instagram’s 1 billion users live outside the United States and more Church members live outside the U.S. than in it. The Church’s global focus is also evident in President Nelson’s worldwide travels and personal ministry to people in many nations. Sharing messages on Instagram will also better reach the youth of the world, as 72% of teenagers use Instagram every day. Young adults (ages 18-31) also make up a large demographic of Instagram users, and Church leaders have a strong interest in listening to and connecting with them. They also have accounts on Facebook and Twitter. Leaders of the Church’s Relief Society, Young Women and Primary organizations also share their experiences and ministry on their individual Facebook accounts.